Rent The Winfield Inn | Corporate Events | Wedding Locations, Event Spaces and Party Venues. This Austin wedding venue features 27 acres of lush landscaping and a historic mansion located on the heart of the grounds. The Winfield Inn tells a story with so much to offer. The Winfield Inn can accommodate many different budgets with venue rates starting at $3,500. We want to hear about your vision. Our team is excited to show you around the property and create a customized quote that meets your needs. The Winfield Inn was built in 1883 and features a vintage mansion on 27 acres shaded by gorgeous live oak trees. The downstairs wrap around porch filled with white wicker rocking chairs & wooden Adirondacks offer plenty of room for your guests to relax & mingle. The estate and oak trees offer a perfect retreat from the Texas sun. It creates privacy and intimacy that is unmatched for a Texas hill country wedding. 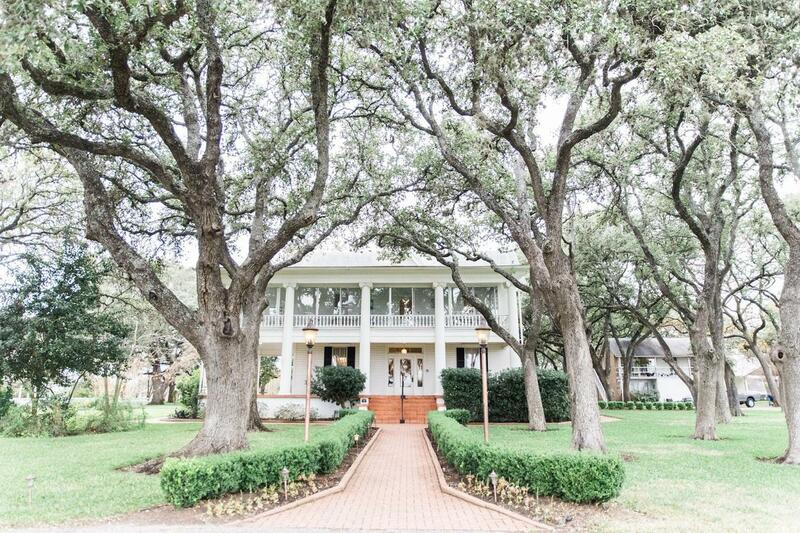 You're in your own world of southern charm with this unique Austin wedding venue. The grounds of this wedding venue is perfectly lush and shaded by live oaks. The Winfield Inn has several locations to tie the knot and amazing back drops that make your wedding day seem like you are living in your dreams. in case of rain or inclement weather. The Garden Gazebo marks the perfect location to exchange vows. The gazebo makes an unforgettable backdrop that provides perfect light and shade during the magic hour and all throughout the day. There is ample room for chairs up to 500 + guest and a brick pathway leading up to the gazebo. The Winfield Inn is known for it's enchanting Oak Trees that make beautiful backdrops year round. There are various spots to exchange vows including, The Garden Gazebo, any one of our Oak Trees, The Garden Ballroom, and in front of The Winfield Inn. Whether you are celebrating a milestone in the company or simply gathering for a company social or company picnic, The Winfield Inn is the place to rejuvenate and relax conveniently. We are 20 miles south of downtown Austin and 5 minutes west of I-35 yet nestled in the Texas Hill Country with nature that surrounds. We have plenty of parking space that can accommodate buses and shuttles. Whether your company event is large or small, we can certainly accommodate and provide an outdoor corporate event space to relax and unwind.